If you've always dreamed of an heirloom diamond ring passed down from your great great grandma, then this is the perfect way to make that dream come true without breaking the bank! 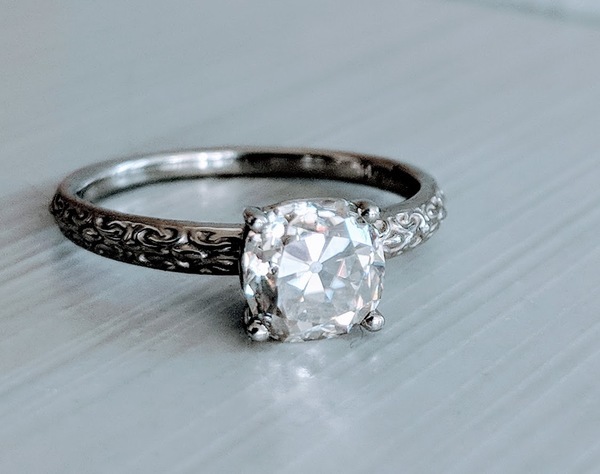 This ring looks like piece from the early 1900s, complete with a 1.3 carat moissanite specially cut using the antique cushion cut faceting pattern. Can be sized to any size you need! This is 10k unplated white gold. Currently a size 7.